IT’S BEEN 30 years since Alice Doyle and her merry band of idealists, fresh out of the University of Oregon, settled on Rat Creek with plans to start a free, alternative school. What they ended up raising was not students, however, but an amazing assortment of plants. Doyle and her partner, Greg Lee, started out by growing species marigolds in the mid-’70s; now they produce more than 2,500 kinds of perennials, annuals, herbs and vegetables. Log House Plants burgeons up a country hillside to fill 26 greenhouses and employs 45 people during the peak season. Big-box Isuzu trucks pull out of the nursery to roam roads from Pasadena, Calif., to Spokane, delivering plants to dozens of nurseries. Many of the most exciting plants available today started as yet another inspiration from Alice Doyle’s busy brain. A whirling dervish of enthusiasm, she peruses old reference books and travels the world in search of the coolest plants. Doyle and Lee run the wholesale nursery, two other original members of the party operate a bookstore in nearby Cottage Grove, and they all live together with assorted kids and pets in a rambling log cabin on the banks of Rat Creek, 30 miles south of Eugene. Log House Plants bristles with industrious creativity because the employees have areas of responsibility based on their particular skills and interests. “We’re blessed with overqualified employees,” is how Doyle describes the success of their team-based management approach. Linguists, choreographers, artists, graduate students, a fiddler and ballet teacher poke seeds into pots, haul specially mixed soil, transplant, and generally practice the whole-hearted commitment characteristic of the operation. 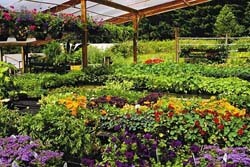 Doyle’s travels, contacts with growers worldwide and eager scholarship have resulted in innovative collections of plants, such as the Butterfly Bed and Breakfast grouping. The eye-catching labels describe the plants and explain their origins, needs and benefits while revealing Doyle’s continued commitment to education. Last winter Doyle traveled to India, where she joined in judging the Kolkata Flower Show, the oldest in the world. She botanized in the Himalayas and visited hybridizers near Pakistan. 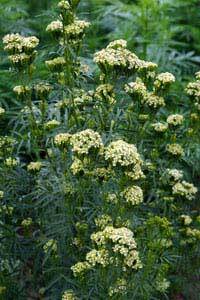 One of the results of that trip is the feathery Tagetes minuta, a pale yellow, fragrant marigold that grows 5 feet high. But Doyle doesn’t just pursue the unusual, she also organizes plants in clever combinations designed to make gardening easier. Log House’s “Wavelength of Color” containers offer monochromatic plantings in black, purple, scarlet, orange or ivory, as well as in variegations. Doyle describes these 14-inch bowls of color, designed so all the plants bloom at once, as “shockingly beautiful and practical.” “Made in the Shade” and “Beat the Heat! Plants that Flourish in the Sun” are two other series for summer planting. All are grouped according to their cultural needs. Unique introductions from Log House Plants include a double-decker coneflower (Echinacea purpurea ‘Doppelganger’), a Mexican sour gherkin cucumber (Melothria scabra) with fruits like little striped watermelon, and the curious rat-tailed radish (Raphanus caudatus) covered with delicious seedpods. Sturdy ‘New Generation’ lupines and the dwarf ‘New Heights’ English delphiniums, both featured on Jackson and Perkins catalogue covers, were introduced by Log House Plants. And there’s more to come. A centaurea that smells like chocolate and a black-leaf mustard are due out next year.